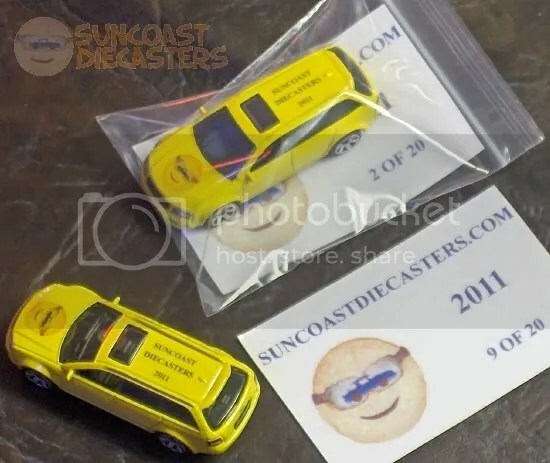 Our 2015 Suncoast Diecasters club vehicle is the Christine movie car from the Johnny Lightning (Playing Mantis) Frightening Ligtnings series. 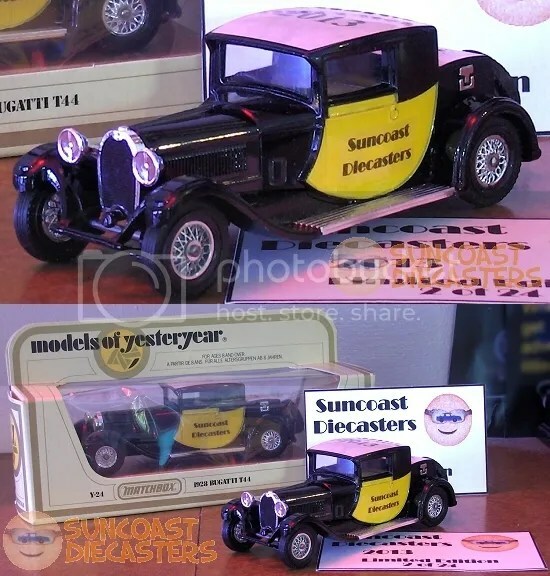 Each model comes bagged with a numbered card and the original JL picturre disk. Ken took an interesting approach for the deco. Rather than solid text, he chose an outlined fount, and filled the interior with yellow. 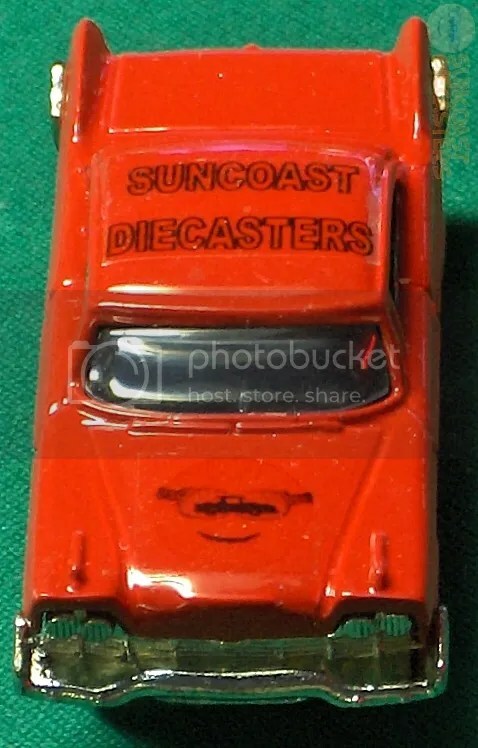 As its on transparent decal paper, the car’s original red easily bleeds through, turning the yellow into a very subtle orange. Moreover, the transparent paper really makes an impact on the hood. You’ve heard of ghost flames? I think Ken invented the world’s first ghost logo! I like the way it almost literally disappears into the hood. We have several left, so contact Ken or Big Tractor Mike (or come to a meeting!) to get one. 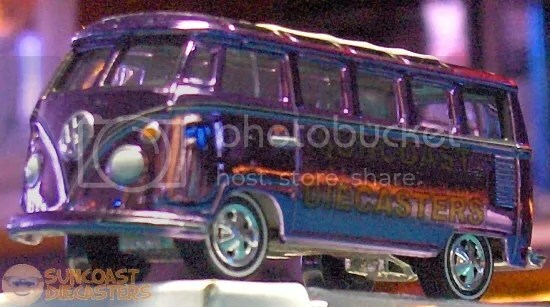 Our 2014 Club Vehicle is the 1965 Volkswagen 21-Window Samba Bus, by Johnny Lightning. It’s actually from the 2002 Holiday Classics series (which explains the high-gloss treatment!). 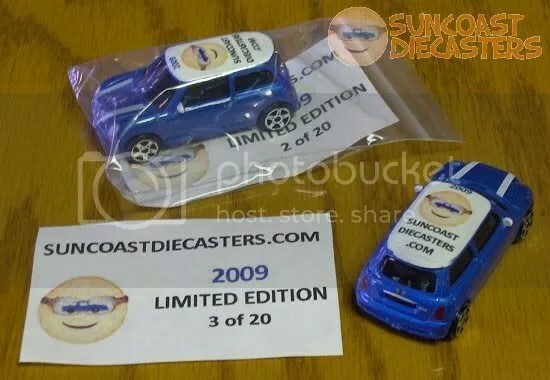 This is a particularly limited edition: while we normally try to get between twenty and thirty models for our club vehicles, we were able to get only fourteen of these models. Further, I think about five have been sold already, so if you want one, you need to get to the next Suncoast Diecasters meeting! 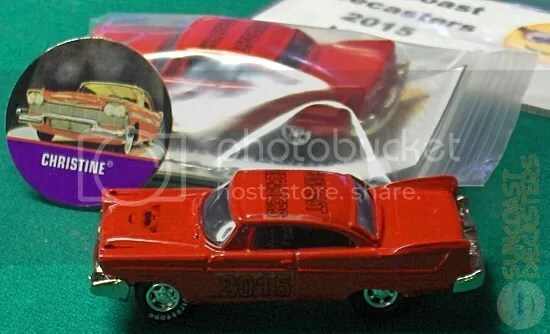 The model features the year 2014 over the cab, and the club logo on the sunroof. Not to mention being a very nicely-detailed casting. Model also includes a window-box which, as you can see in the lower portion of this photo, has a kind of Mid-century modern feel to it. 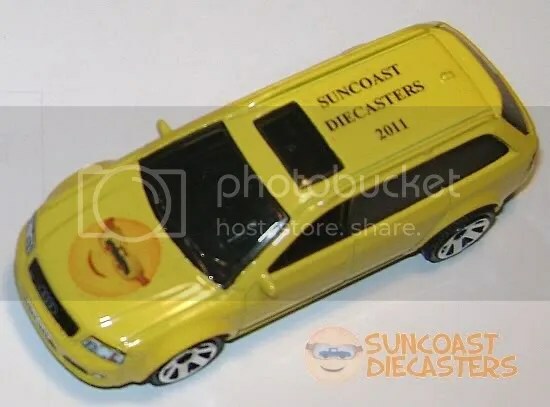 Model also features the Suncoast Diecasters name on both sides. Ken explains the text is actually yellow; it’s the high-gloss purple that gives it that rich gold color. Either that, or this year’s club vehicle is sponsored by the Minnesota Vikings. We continue with Matchbox’s Models of Yesteryear series for our 2013 Club Vehicle. This is the 1928 Bugatti T44, and truly is an example of vintage elegance. Not to mention the beauty of detail afforded by its 1:43 scale. Also note that this year’s Club Vehicle includes its original packaging. 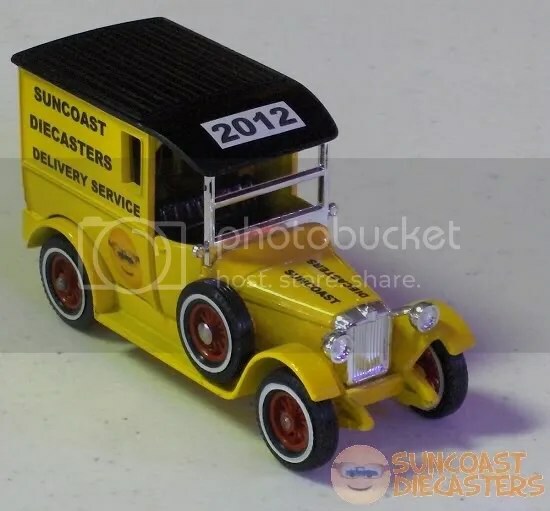 Our 2012 Club Vehicle is the beautiful 1927 Talbot Van, from Matchbox’s Models of Yesteryear series. This vintage stunner is the second-largest model we’ve offered (after the ’06 Convoy). It’s also our largest scale thus far, at 1:43. 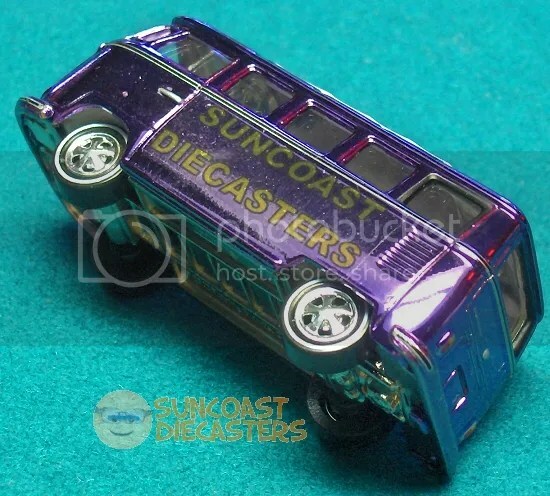 This beauty is a fine lucky number seven in our Club Vehicles series. 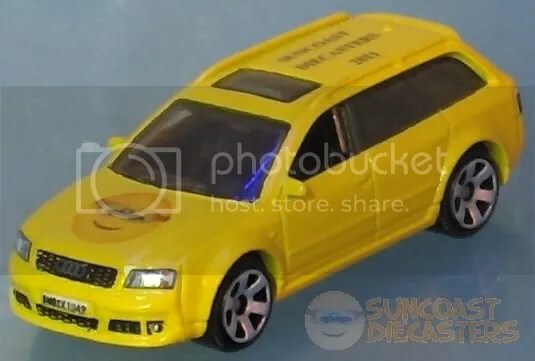 Our 2011 Club Vehicle is the Audi RS6 Avant, by Matchbox. 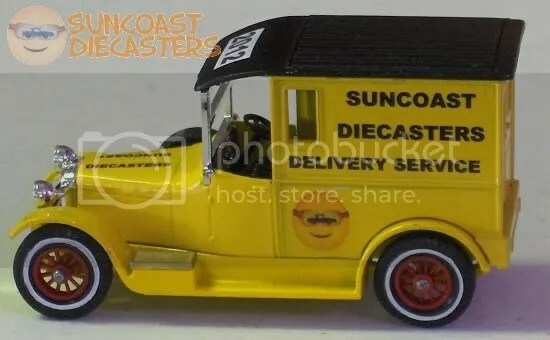 Another unique model, in that this is our first Club Vehicle representing the modern “sport wagon” design. 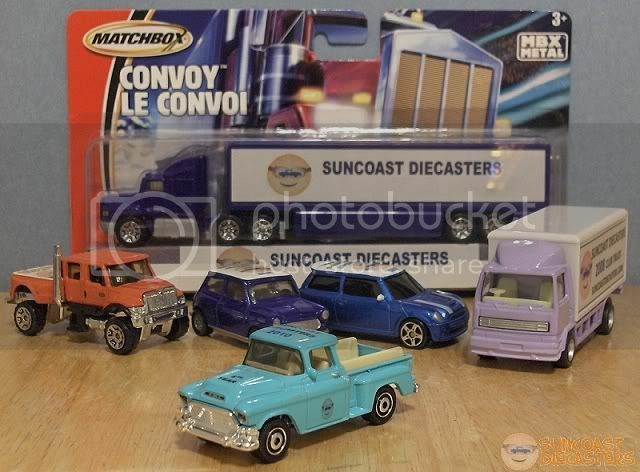 Previous Club Vehicle models (with the exception of the Mini in 2009) have all been some form of truck. 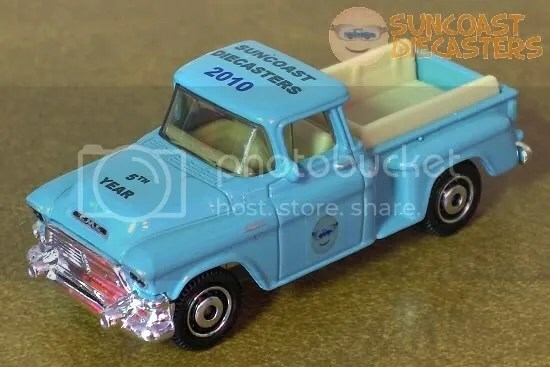 For Suncoast Diecasters‘ 5th Anniversary, we couldn’t have done better than the 1957 GMC Stepside by Matchbox. This elegant model is beautiful even without customization! As a special bonus for our 5th Anniversary, I created this “family portrait” of all our Club Vehicles. 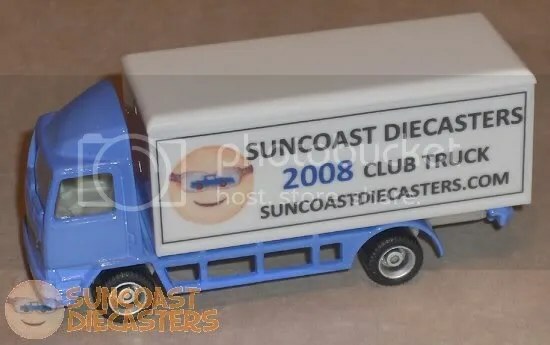 Our 2009 Club Vehicle is unique in that it’s the only one (so far) available in two editions. The first is the BMW Mini Cooper S, by Maisto. 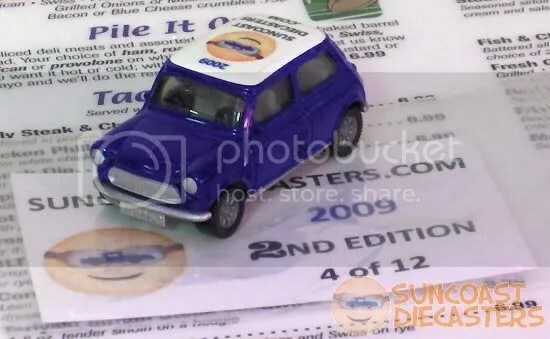 The second is the Rover Mini, by Siku. Our 2008 Club Vehicle is the AdTrucks #C28. 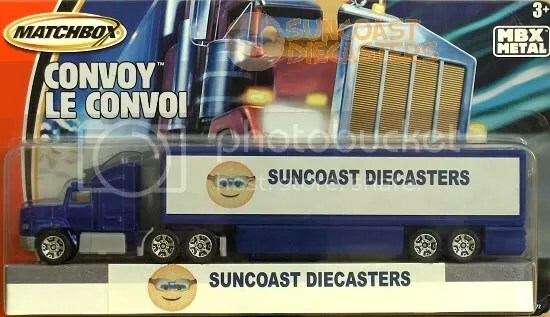 It’s advertised on AdTrucks’ website as 1:87 scale; however, on the shelf next to other vehicles, it seems closer to 1:64 or perhaps even in the 1:50 range. Custom dye color. Optional member name on roof. 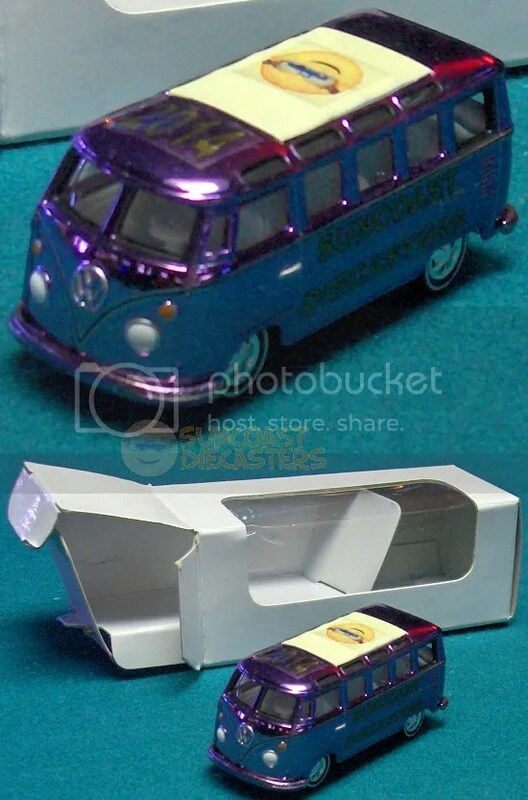 The roof panel can be removed to store paper clips, candy or, hey, even miniature cars(!). 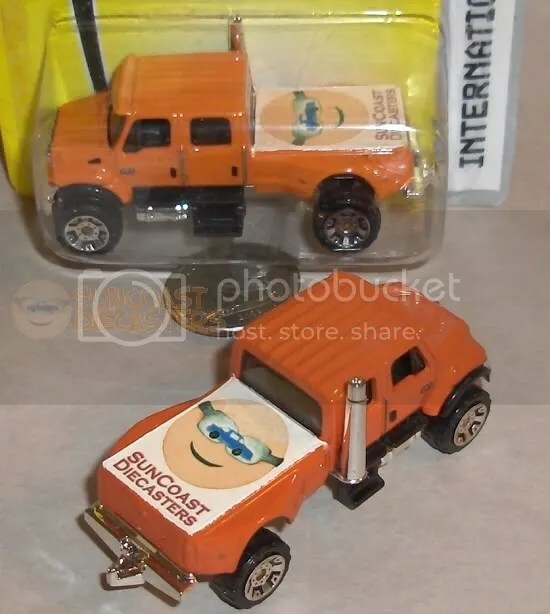 Our 2007 Club Vehicle is Matchbox’s International CTX. Dyed with custom color, and custom club tampo added. Our 2006 Club Vehicle is the Matchbox Convoy. Originally the CY115_05a, Ford Aeromax with Michelin livery. Only one for each club member was made (name included), so there are no extras available.